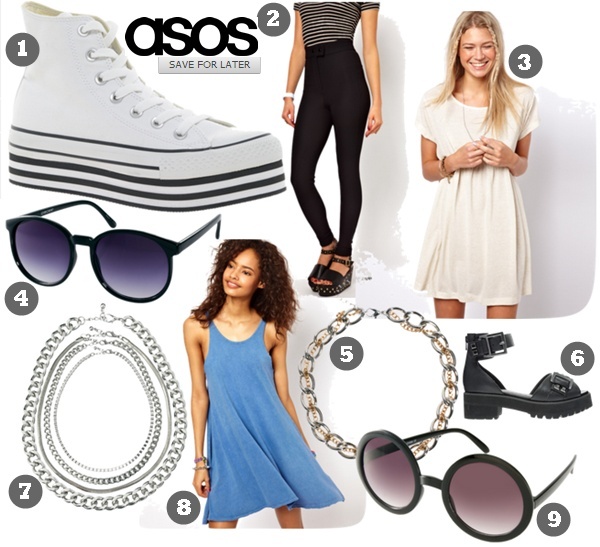 I'm sure it's no secret to you guys that I love me a bit of ASOS, so I thought I'd unashamedly steal Tiger's idea and do a post on what's currently in my 'Saved for Later' basket (her blog is amazing by the way, make sure you check it out). I actually compiled this collage about a week ago and the basket has grown considerably since then to include lots of beautiful things including this, this and this - I can tell that any day now I'm just going to cave and end up getting it all! Also, here's another quick reminder that I'm selling a bunch of stuff on Ebay if you fancy a browse! Click here to see all my listed items. Click here to follow me on Bloglovin' - Google Friend Connect is expected to disappear soon! Click here if you fancy nominating me as 'Best Teen Blogger' in the Company Blog Awards 2013 - it would mean a lot! such nice items, I'm such a sucker for asos too! those sandals are on my saved list too!! I love both of the dresses, they're so cute and you should definitely invest in the riding pants, I absolutely love me! They look very beautiful. I really enjoy these. I have just purchase some leather hobo bags from cwmalls.com, maybe they can just go with these. Anyway, your post is nice.